Two jars of raw Oregon honey - one a single origin Willamette Valley honey, and the other a single origin honey gathered from hives placed around the lush farmland near Mt. Hood - are presented with a smooth and supple olive wood honey dipper. Arranged lovingly in our signature gift box, this gift is designed to tantalize the taste buds. One Bee Local Artisan Portland Farmland Honey, 8.62 oz. One Bee Local Artisan Willamette Valley Honey, 8.62 oz. One Olive Wood Honey Dipper. Your gift is securely wrapped to safeguard the shipping process and arrives presentation-ready in our signature gift box. A complimentary card with your personal message is included with your gift. Gift Box Measures 8" x 8" x 4". After discovering the different flavor profiles, colors and textures of honey from hives placed around Portland, Oregon, Bee Local founder Damian Magista made it his mission to produce and source only the most sustainable, healthy and uniquely delicious honeys in Oregon. Oregon Blossom Honey Gift is a hand delivered gift. These gifts are delivered by one of our local design centers located throughout the United States and Canada. Same day delivery is available for most gifts when ordered before the cutoff time. The cutoff time for Oregon Blossom Honey Gift is 2 PM in the recipient's time zone. Olive Wood Honey DipperAn olive wood honey dipper is a pretty way to spoon honey from the jar right to your plate. Olive wood's beautiful grain shines and adds a rustic statement. 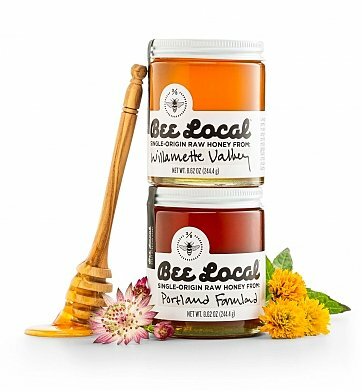 Willamette Valley Bee Local HoneyHarvested from hives located in the northern portion of Oregon's most fertile valley surrounded by vineyards, hops, and berry farms; this honey is robust yet complex. It captures the magic of the Willamette Valley. Portland Farmland Bee Local HoneyTaken from hives located in lush Portland area farmland near Mt. Hood, this honey is exquisite. Deep blue and blackberry notes with lovely rich finish. Plenty of structure makes this honey an instant classic for sweet or savory applications. Two jars of raw honey, single sourced from hives in Oregon's lush Willamette Valley. Presented with an olive wood honey dipper, perfect for drizzling. Includes a complimentary card with your personal message or greeting. I gave this honey as a holiday gift. My friend loves it with her expresso in the morning. She also likes the box that it came in.